Indy Eleven moved into the top four in the Eastern Conference with a 3-0 victory against the New York Red Bulls II at Lucas Oil Stadium as the hosts scored all three goals in the first half. Indy took the lead in just the second minute as Eugene Starikov guided home a cross from the right by Dylan Mares. They maintained that advantage thanks to a good tipped save three minutes later by goalkeeper Owain Fôn Williams on a free kick by New York's Andreas Ivan. 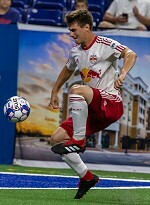 New York's Ethan Kutler flashed a shot just wide of the left post in the 19th minute from the top-left corner of the penalty area. Two minutes later, Starikov fired home a first-time left-footed finish from the left side of the penalty to double the host's lead. Indy added a third just before the halftime break as Reiner Ferreira scored his first goal of the season with a curled shot that found the bottom-right corner of the net. New York's Anatole Abang had a chance early in the second half that was smothered by Fon Williams in the right side of the penalty area, and the Red Bulls II hit the crossbar on the hour-mark as a turning shot by Brian White was inches away from a reply.